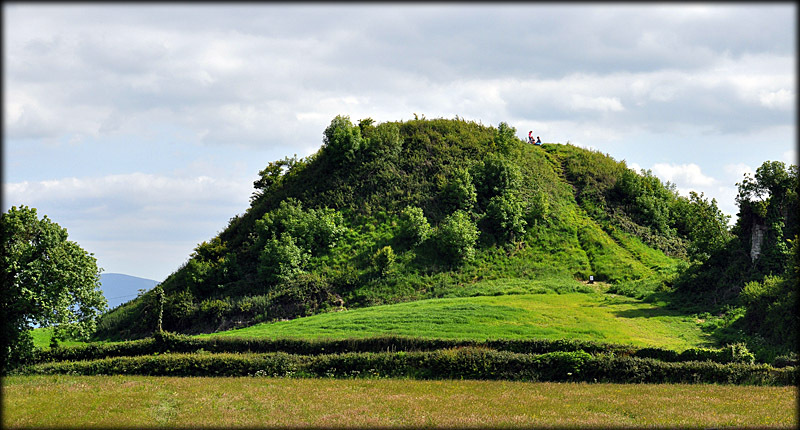 This superb example of a Norman motte, as well as the motte in Kilfeakle, was constructed in 1192 during the Norman campaign against the King of Munster, Donnell O'Brian-Domnall Mór Ua Briain. 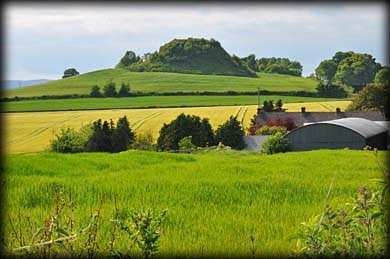 It is believed the motte was built upon an early inauguration site for the kings of Munster, before the inauguration moved to Cashel. The much overgrown rectangular bailey extends out from the north east side of the motte. The ruins of a later overgrown castle are still present inside the bailey. On the top of the motte, hidden in the long grass, are the remains of a walled structure. There are extensive panoramic views from the top of the monument, including the view to the north pictured above. 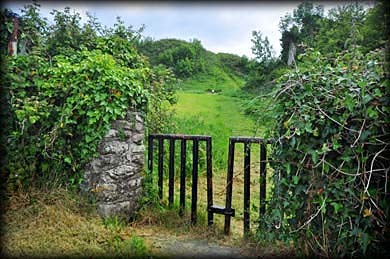 In left corner we can see the path that leads to the motte with Knockgraffon Church and Castle visible in the distance. Situated: From Cahir take the R690 north for about 3 kilometres. Turn right onto the N24. Then 200 metres take first exit at the roundabout. Next roundabout 3rd exit and final roundabout 2nd exit. Stay on this road for 1k before turning left. The motte is about 1k down this road. Discovery Map 74: S 0455 2895. Last Visit: June 2015.